Scuba Diving by day and then partying with hundreds of beautiful women by night! Looking for a young beautiful wife? Then look no further than the Philippines. It is very common for Philippine women to marry men 20, 30 and even 40 years older. During your trip you will have the opportunity to meet hundreds of young sincere Philippine women looking for marriage. This is truly the best singles vacation you will ever take. Come and enjoy the beautiful reefs and nightlife on a scuba diving vacation in the city of Davao on the Gulf of the southern Philippines. AFA provides 10 beautiful, sincere, marriage minded women for everyone of our guest. Click here to see photos from our last Philippine tour. You will attend two parties with young beautiful Philippine women who are just waiting to meet you. Besides the social events our professional staff will make sure every moment of your stay is the best it can be. From arranging dates to making dinner reservations and organizing day excursions our staff will be there for you during your entire Scuba Diving Vacation. Our office is just located a few blocks from the hotel. With AFA everything is provided, scuba diving lessons, equipment and certified competent and experienced scuba diving instruction for both beginner and experienced scuba divers. Coral reefs teeming with colorful tropical fish, which will provide excellent scuba diving and snorkeling areas, cover the entire coastline, but are particularly concentrated in certain locations, such as in the Linusotan coastline, and along the eastern and western parts of the Kaputian coastline. Ligid Caves: Off the northeast tip of Samal Island lies Big Ligid Island. On Ligid's west side, a night dive reveals hundreds of fine golden sea cucumbers densely littering the reef amid a rainbow of soft coral, hydroids and basket stars. The slender reef top, covered with leather Coral drop sharply at about 15m. Several meters down are two caves, one of which has three entrances that lead to a corridor. 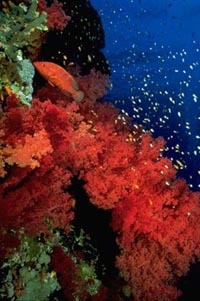 Both are inhabited by small reef fish, Black Coral, Soft coral and Sponge crabs. Outside the caves, you may find several species of crabs, Tunicates, Scorpion, sleeping Parrot and Rabbit fish, Morays and Razor fish hovering vertically in a harp gorgonian. Pinnacle Point: The southeastern tip of Big Ligid has one of the most challenging dives, due to the healthy current. Heading south along the wall which has a nice outcropping of gorgonians, many with crinoids clinging to them, we encountered morays and an octopus hiding in a few of the many small holes, and many big eyes and Cardinal fish in the larger ones. Off the point are a trio of large formations topping out at 8 to 15m below the surface, each one slightly different. 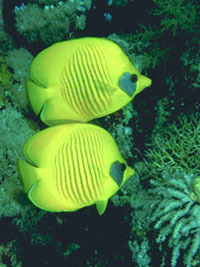 Schools of Pennant Butterfly fish swim about. 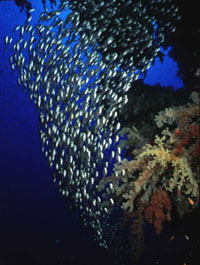 Below 30m are schools of Unicorn Surgeon fish, Emperor fish and Jacks. Coral growth is varied and colorful. The middle pinnacle's seaward side is covered with pink soft coral. Slightly more protected areas have large gorgonians, black coral, lots of altheas and tubastrea, angelfish, scorpionfish, lionfish and many invertebrates. Angels Cove: A marine reserve, this area has a good hard coral cover in the shallows, making it good for snorkeling as well as diving. It is adjacent to Mansud Wall, giving the site variety. The wall is to the northeast and starts as a steep slope to about 10m where it alternates between wall and steep slope. Close to the point there are whip coral, gorgonians, large sponges and soft coral. We saw several Lionfish, Razorfish, juvenile Sweet-lips, sea snakes, and colorful reef fish. 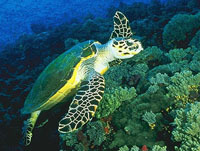 Turtles are occasionally sighted and there have been reports of whale sharks and even one sighting of a dugong. Malipano Sunken Wrecks: Inside the Malipano anchorage at Pearl Farm Farm are two World War II Japanese ships lying about 40m. 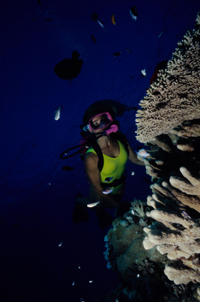 For your perfect scuba diving vacation experience.